i know this drama is more than just romance... but... this episode 7 they showned a lot of small scenes of No Eun looking at President Goo Seung Hyo and President Goo looking at her interacting with Jin Woo. I love that not only they observed each other at dog cannel numerous time, President Goo look at her when he drives past, and she observed him at the BBQ restaurant. They both like dog enough to came back to the dog cannel. It seems like, while he's thoroughly intrigued and almost enamored with her, she's still observing him, trying to figure out if he's a good person or not. And although she's not impressed with the pay-for-service deal he pushes down everyone's throats the preview for the next episode shows that she hasn't given up on him yet, yay! Even if they don't go into real romance, I hope she can become his second true friend. Even if they don't go into real romance, I hope she can become his second true friend. Is first BFF the puppy? This episode made me love the president even more, his development is smooth and increasing. I find it interesting how this drama treats the protagonists differently than usual: JinWoo, the epitome of the positive protagonist fall into shadows and into the abyss of dark emotions, while Mr Gu, the negative epitome grows into light more and more. JinWoo falls into dark emotions, while Mr Gu experiences more and more positive emotions. If last episodes I was disgusted by the doctor from the organ center, this episode made me see him in a different shade of gray. I like how they portray him not just a typical shallow character, rather different shades of humanity. He is not a bad guy, he is someone whose job depends on the whims of the patients and I understand, in a way, why he behaves in the way he does. He does not seem to be talented / extraordinarily intelligent, does not give the impression to come from a rich background, so my guess he took his specialty hoping he would make money without much stress. Yet, now he is at the mercy of his own patients. What makes me glad is that he shows concern for his friend and cares in a way about their friendship, not seeking his company just for support and influence. It's a friendship based on mutual benefit, but they still seem to care about each other. SunWoo is such a puppy and the way he refrained from not crying when he talked about the surgeries the arrogant director did. I hope he was not one of his patients who have been fooled by him, that would be sad.I want them to give him more contribution for the plot, not just being the protagonist's brother, who has a crush on his brother's love interest. He has so much potential, right now he is, after Mr Gu, (honestly, for me), the character with the most potential to be a surprise / to have something hidden that would make the plot explode. Also for the Barbie NoEul, I still do not like her, and that will not change until I see her at least performing a surgery or doing something that doctors do (instead of gossiping with the nurses or flirting with the president) ! I want her to see struggling to save her patients, to see her being involved in her job. Till now, she is all words and nothing factual to contribute to her claims. She has nice sentences and appears smart, but I want to see her treating patients and feeling remorse for failures. I want something that would make me care for her !!! OMG he said that! I need sub to understand the whole episode. When does sub usually come for this series? does any know? Episode 7 ended on quite a twist! Now that there is sub...President Goo! you are just like anyone else. Asking your friend about the girl you are interested in, pretending not to know her name... I don't know if anyone in real life would have No Eul gut to point at her boss when the animal shelter lady ask did she leave something behind. In series, this might seen as playful, but I think in real life this would be flirting...no? In such a serious series (can be dry for some one) President Goo secretary is the perfect antidote - inserting simple funny scene in between such complex businessman and doctor work. she's a refresser! President Goo common sense! While Goo may not be very popular with the medical staff , I like him. He’s shrewd and he gets the job done. He has the hardest job caught between the ambitions of the group’s equity owner(s) , he’s own desire to overcome any challenge and the expected feelings of contempt coming from the hospital staff. They may see him as the enemy and paint themselves as victims , but it is clear there are inefficiencies, abuse of power among higher ups and malpractices by covering up medical errors. I thought it was rather convenient of the Cancer Chief to push the blame onto a dead man. Was it really Director Lee who ordered the error to be covered up? I don’t know why but I don’t trust what we’ve been told. I find myself disliking most of the center chiefs with the exception of the Chief Surgeon. I feel a little sorry for both him & JW . They are the good guys to me and they must be struggling with Lee’s death and new reveals of what Lee had supposedly done in the shadows. As things progress I believe they will also discover that their supposed comrades in this fight against the restructuring, have more to hide. I am beginning to understand now why JW sees SW all the time. JW has an extremely high sense of empathy & takes on a lot of burden on himself. I feel even worse for him because the flashbacks showed us that Director Lee was the first person who was able to reach out to JW as a kid struggling with his emotions. So I can only imagine the feelings of disappointment & despair that he has when finding out that Lee isn’t the hero that he has put on the pedestal over the years . I am 1/3 way into episode 7 and quite like it. Drama has a lot more heart than SF. I like the direction it is going, making it more than just a medical politico thriller. The characters are human. I think the next few episodes will have us doubting our preconceptions. @kmsl what, What, WHAT.... you have not watched Secret Forest? JSW is a different character there. My first time seeing JSW was in the movie Marathon. Cried my eyes out. I know, i know I slept on that one. But I'm finally "woke"
i know this drama is more than just romance... but... this episode 7 they showned a lot of small scenes of No Eun looking at President Goo Seung Hyo and President Goo looking at her interacting with Jin Woo. I love that not only they observed each other at dog cannel numerous time, President Goo look at her when he drives past, and she observed him at the BBQ restaurant. They both like dog enough to came back to the dog cannel. They certainly observing each other alot....there is no sub yet...so we don't know if this is personal interest or this is purely business. But knowing Cho Seung Woo, his projects never really tend to have good romance. You're not alone on this one. I'm shipping No Eul with Mr Goo and of course, Jin-woo (lol). I'm even shipping Jin-woo and that reporter Choi Seung-hyo(?). My brain is wired that way hahaha. And yes, Cho Seung-woo needs to get a rom-com next!!! – You used this line already Mr. Grim Repear. can anyone share me the video clip of the tonight prevew? Ep 8? Preview having deputy director Kim exploded when facing President Goo. Flashbacks of some moments when he physically abused other hospital staff members including his own team. And of course, we have a female lead who openly pursues an antagonist. I am afraid for President Goo. 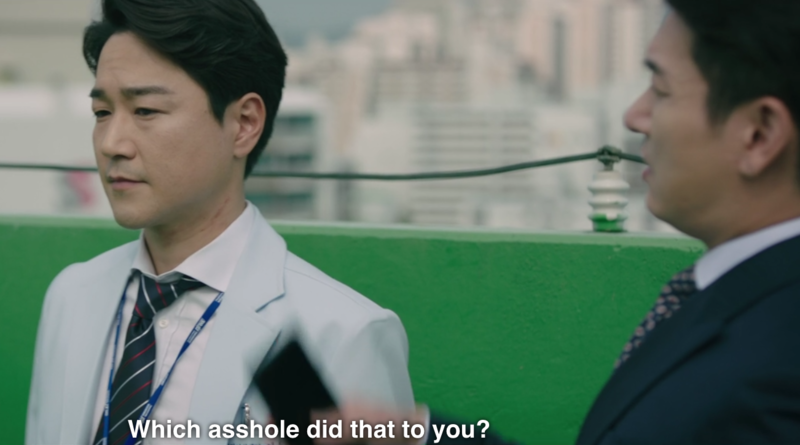 Dr. Kim: We were the ones who had to bear the burden While one punk pretended to be some noble guy with determination and the rest acted like philanthropists, we had to work our asses off to pick up the slack! It's sad to hear someone blaming his wrongdoings on others. Does he really believe he's a selfless soul who saved the hospital with the hundreds of questionable surgeries? Is this where the embezzled fund come from? Ep 1 to 3 - Ok, we know there is going to be no romance in the story. Concentrate on the mystery and drama. Ep 4 - There is no romance. But... but... but what about the dog and JSW and there are flower petals in the background. That's alright. Concentrate on the plot. The old director is dead for heaven's sake. The hospital. The patients. Ep 5 - There will be no romance. Tiny hope rising with Dr. YJW-the reporter interview. Dr. LNE-President Goo watching babies in ICU. Don't fall for it. Do not fall for it. It is all a trap. There are more serious things to think about. Dr Joo is slaving away and all you think of is louve! Shame on you! Ep 6 - Pretty reporter is back. Even if it is only for a few minutes. Hearts fluttering at the cream-strawberry sandwich breakfast in elevator! Dog shelter! Jeong-sin Cha-ryeo!!! Ep 7 - "Did you leave something behind?" She points to him! And don't even get me started on the rest of episode and preview!!! I am hoping against all logic that writer Lee Soo Yeon is compensating us for the lack of love line in SF. But Jeong-sin Cha-ryeo!!! Writer, you better not play with our hearts!! Also you better write good scan results for the puppy!! Will be back after anchoring my ship to discuss more plot points! Episode 7 gave some insights into the private person that is president Goo. We also see the Ye brothers take upon themselves to be Batman and Robin. Jin-woo walking into the empty director's room for the needed mental support after taking a (last) beating from Dr.Kim. The look. The Dark Knight. Strong likelihood Dr. Kim operated on little Seon-Woo's knees after the car accident, giving him some artificial joints unnecessary which eventually failed him. Jin-Woo knows this. Seon-Woo still tears up over it. The brothers are sticking it to the man. Like how hard president Goo tries to learn on the job. He actually is a good CEO. He understood compartment syndrome, surgical tools, nurses union salaries, mortuary expense. I agree with No-Eul, he's the one they have been waiting for. Love how Goo lowered to eye-level with Seon-Woo. Props to Seon-Woo too for getting over his fear, going into the lion's den alone. Grrr, assistant Kyung-Ah, please slap the orthopedic doctor. I grinned when Seon-Woo breaks into a nervous smile. He has been holding his breath before. Dr. Kim has been doing unnecessary ortho surgeries with artificial replacements on people of all ages over the years. With the current technology, the joints will deteriorate in a decade or so causing pts to become physically debilitated. Sounds like patients were never informed of the artificial parts expiration date. Since surgical centers go under often, it's hard to make him accountable despite a streak of complaints. LOL at president Goo cooperating with HIRA, while thank the god that Seon-Woo didn't come to investigate his pharmaceutical company deal. No poking around at other stuffs, K? Goo and Chang Sunwoo keep each other grounded. I like how real their friendship is. See how uncomfortable president was when the chiefs cozying up to him. Laughed hard at their crazy one-up diagnoses of my pup. Sunwoo Chang's job gets to him. How can you place the value of one person's life over another? Is it joy or sadness that he's supposed to feel? I caught the wink by dad. He's a goner with the puppy. I like how he cares only the end goal and not the methods. He's a businessman. " I came to do my job. I don't plan to ruin anyone or become anyone's hope". There has to be something you like outside of your job? They're continue with plan to build the hospital at Songtan. What will Goo get once he accomplished his mission? More missions? @staygold hahaha... I love the romance. Writer-nim and MY JSW are sooo good. @triplem I am thinking like you. Mr. Gu is not really the bad guy, rather KTS and the Cancer center director. Their fakeness and hypocrisy are really annoying. In the last episode, they acted as if they cared for the dogs, while in reality they wanted to look good in front of Gu and the journalists. From my point of view, YJW acts as if he was LBH's son. The way he tries to protect the Hospital director seat shows how much he respected and liked LBH. I also think that the Cancer Center chief blamed LBH because he was dead, whereas in reality, KTS was the one who covered it up. I hope, the pediatrician NE and Mr. Gu get closer... I really ship them because she is the only one who has noticed his warmth and sincerity. She might disapprove certain methods from him but she can definitely see Gu beyond his position as president. I hope that at the end, the orthopedic surgeon Dr. Yoo/Joo will become the Hospital director. @triplem @bebebisous33 LSY gave us the kind of character that I secretly hoped for. Hospital administrators are often misunderstood. There are many who do good work with what is given. For Goo, anyone who comes in with restructuring in mind, will open up closets and pandora boxes. I actually am worry for his safety if he ever joins hands with the Ye brothers/Dr. Joo and digs too far. The murderer could strike again. President Goo has a keen eye for business. He turned an animal shelter volunteer day into a publicity event to drown out the bad press on his hospital’s med error. While there, he can’t help but notice the amount of dogs need veterinary care. The next day, he directed his people to start looking into adding a veterinary dept in Sangook hospital. Just like No-Eul said, it’s hard to know if Goo is a calculated person who always planned ahead and do things to his advantage or his actions are mostly reactions to situations and thus, sincere. He evaded the question twice: Is there anything he wants to fulfill apart from just climbing the ladder and give out paychecks? I’m happy No-Eul helped Jin-woo see why his brother refused to go out to eat and rarely leave home. Guy is a homebody, that’s all. Can’t believe Jin-woo would cut short the dinner for his brother’s sake. Also glad he decided to fight Dr. Kim the legal way, by filing a complaint. Jin-woo’s walking out while hearing in the background Dr. Kim’s panic conversation with the investigative agency is continued with the voice over between the two brothers. JW: Why you? Why did you come? Why didn’t you tell me (that you are the only investigator)? SW: Because if I did, you would have stopped what you were doing? If I had told you I have been investigating, there was a chance you’d change your plan. Seon-Woo knows his brother too well. He knows he is Jin-woo’s weakness. @bedifferent Help! I can't handle this level of cuteness. Gimme the cutthroat President anytime.